A name inspired by the shape of the integrated backrest and armrests which looks like a bird’s wings. 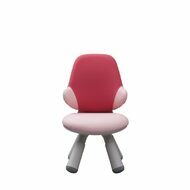 Seat plate wrapping the body like wings and the integrated armrest design maintains the stable posture while minimizing interference with the desk. Easy seat plate and Backrest depth and height adjustment for the children in the growing period. 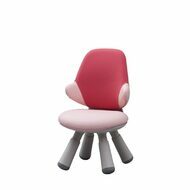 The chair is designed in the roundish form overall without protrusions and with the sponge extending outward from the injected parts so that children are not injured easily when they bump into it. 25kg center bar: Designed for young children, whose weight is low, to handle easily. Prevents floor scratching as well as slipping for children to use it safely.